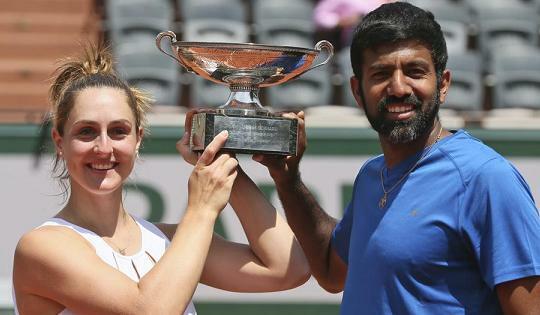 Rohan Bopanna lifted his maiden Grand Slam title by winning the French Open mixed doubles trophy with Canadian partner Gabriela Dabrowski, becoming only the fourth Indian ever to clinch a major, on 8th June 2017. Bopanna and Dabrowski, seeded seventh, won the title following a stunning turnaround in the final. Playing only his second Grand Slam final, Bopanna and Dabrowski saved two match points to eke out a memorable 2-6 6-2 12-10 win over Germany's Anna-Lena Groenefeld and Colombia's Robert Farah. Bopanna and Dabrowski were down by two points but Farah and Groenefeld muffled the chances. Bopanna and the Canadian then had two match points and they sealed the championship when the German double-faulted while serving at 10-11. This was only the second time in his career that Bopanna had reached the summit clash of a Grand Slam. In 2010, he had made the final of US Open with Pakistani parter Aisam-ul-haq-Qureshi and lost to the legendary Bryan brothers -- Bob and Mike. Only Leander Paes, Mahesh Bhupathi and Sania Mirza have won Grand Slam trophies for India. Dabrowski blinked first as she lost serve on the deciding point with Farah easily smashing past Bopanna on an overhead volley, set up after a rally.